Greer's OC | Top Ten: Mother’s Day Brunch Simplified! 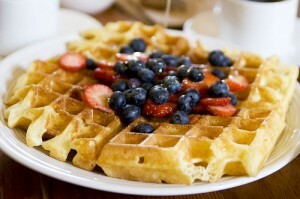 Top Ten: Mother’s Day Brunch Simplified! Mother’s Day simplified: Considering take mom out on her special day? Here are ten favorite OC restaurants providing sit-down brunches, dinners, as well as prix-fix value menus to help make moms feel special. Mother’s Day brunch special with live flamenco entertainment. Brunch is offered from 10:30 a.m. to 3 p.m., and full dinner menu from 4 p.m. Choose from chorizo scramble soufflé; popular chicken hash; huevos rancheros, spit-roasted jidori chicken, crab & shrimp enchiladas and much more. Along with fresh mimosa, Cha Cha¹s offers a selection of unique, handcrafted cocktails and margaritas. Brunch costs $17.95, add $6 for bottomless mimosas. 110 W Birch St., in Brea. Bottomless Champagne Brunch, three Polynesian shows, live fire dancers and free gift for all Moms! Sunday Brunch from 9 a.m. – 3 p.m., which will include an extravagant buffet with bottomless Champagne and traditional brunch offerings alongside Cantonese-style entrees and carving stations with prime rib and fresh salmon. Three seating options (9 a.m., 11 a.m. and 1 p.m.), which must be specified during time of reservation. Brunch cost $30 for adults; $13 for those 12 and younger; children ages 5 and younger eat free. Dinner starts at 4 p.m. with a 3-course Mother’s Day prix-fixe dinner menu for $25 or full dinner menu. 16278 Pacific Coast Highway, in Huntington Beach. Mother’s Day Special: Featured menu items with a beer or wine pairing suggestions just for Mom. Haven serves upscale gourmet cuisine in a relaxing pub-like atmosphere with handcrafted microbrews, hard to find beers and boutique wines. 190 S. Glassell St., in Orange. Mother’s Day Champagne Brunch served from 11 a.m. to 3 p.m. with live music. Costs $34 per person; children (under 12) menu $15. And Mothers receive 50% off brunch menu on Mother’s Day! LUCCA’s “Mother of all brunches” is an extravagant brunch buffet and special deal for children under 12 by allowing them to pay according to their age! The popular Mother’s Day brunch buffet, offered from 9:30 a.m. to 2:30 p.m. Brunch buffet costs $29.95 for adults ($24.95 without Champagne). Open 9:30 a.m. to 2:30 p.m.
6507 Quail Hill Parkway (Quail Hill Village Center), in Irvine. This Mother’s Day, bring your family to PREGO for a Tuscan-style Mother’s Day buffet brunch! From 11 a.m. to 3 p.m. enjoy a made-to-order omelet bar, seasonal insalate bar, antipasti, freshly made pastas, carni calde, Prime Rib carving station and Italian pastries! The spread is priced at $29.95 for adults, $14.95 for children 7-12 years old and free for those 6 years and younger. 18420 Von Karman Ave. in Irvine. Treat your Mom to a special brunch at Royal Khyber, the North Indian cuisine specialty restaurant from 11 a.m. to 3 p.m.
Costs $19.95 per person, additional $4.95 for Champagne or Bloody Mary. 1621 W. Sunflower Ave. (at Plaza Drive) in Santa Ana. Corona del Mar’s English style gastropub (on the side of Five Crowns) is adding some great selections just for Mother’s Day including lobster quiche, lox and bagels, and Belgian waffles. Of course, they’ll serve the infamous prime rib sandwich and chicken pot pie as well. 3801 E. Coast Highway in Corona del Mar. Mother’s Day Special: Sunday Brunch and a dinner menu of Chef Deborah Schneider’s innovative Baja-inspired cuisine. Signature antojitos (small plates) and Baja-style street tacos—prepared in an exhibition kitchen surrounded by counter seating—along with innovative entrees, hand-made cocktails, and desserts that are uniquely Baja. Open 10 a.m. to 11 p.m.
251 East Coast Highway, in Newport Beach. In celebration of Mothers everywhere, The Winery has planned a very special Mother’s Day, complete with live contemporary Jazz and irresistible chocolate truffles. Mother’s Day Brunch from 11:30 a.m. to 3:30 p.m., served along with full dinner menu from 11:30 a.m. to 8:30 p.m.
2647 Park Avenue, in Tustin.